Home History & Politics Why Are Democrats Represented as Donkeys and Republicans as Elephants? Whenever Election Day comes around the corner, millions of Americans head to the polls to cast their vote in the yearly political battle between Democrats and Republics, or donkey versus elephant. Although both of these party’s platforms have changed considerably throughout American history, their iconic representations have remained the same for more than a century. Despite the fact that they often serve as a major emblem to political campaigns each year, many Americans wonder just where these symbols came from. After all, why would Democrats choose to be affiliated with the most mocked member of the horse family and why would Republicans decide to be represented by a pachyderm with ivory tusks? The Democratic Party first became associated with the donkey during the political campaign of Democrat Andrew Jackson in 1828. Since Jackson’s opponents often referred to him as a “jackass,” he decided to utilize the image of a strong-willed donkey to boost his presidential campaign posters. However, this political icon was not popularized until the mid-nineteenth century by one of the most influential and popular cartoonists in history, Thomas Nast. 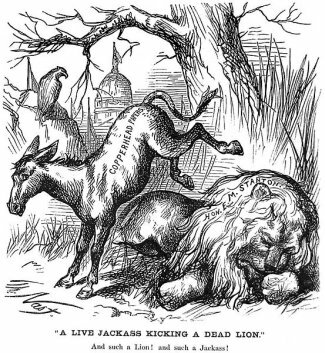 In 1870, Nast drew a cartoon for Harper’s Weekly magazine titled “A Live Jackass Kicking a Dead Lion.” The donkey, representing the Copperhead Democrats that were strongly in opposition of the Civil War, was pictured kicking a lion, which was intended to symbolize the recently deceased Secretary of War Edwin M. Stanton. In 1874, Thomas Nast created another famous cartoon entitled “The Third Term Panic,” which was in response to the rumors that Ulysses S. Grant would be running for an unprecedented third term in office. Since the Democrats reacted to this news by comparing Grant to the dictator Julius Caesar, Nast depicted the Democratic donkey dressed in a lion’s skin labeled Caesarism in order to frighten a pack of animals. Nast chose this representation to demonstrate that Democrats are disguised as ferocious predators when they are actually unwise and harmless. Among the other animals was an elephant labeled as the Republican vote, which was fleeing towards a pit of inflation and chaos. Although the rationale behind the elephant according to Nast is unclear, experts believe that it was intended to depict Republicans as large powerful creatures that are destructive and careless when frightened. 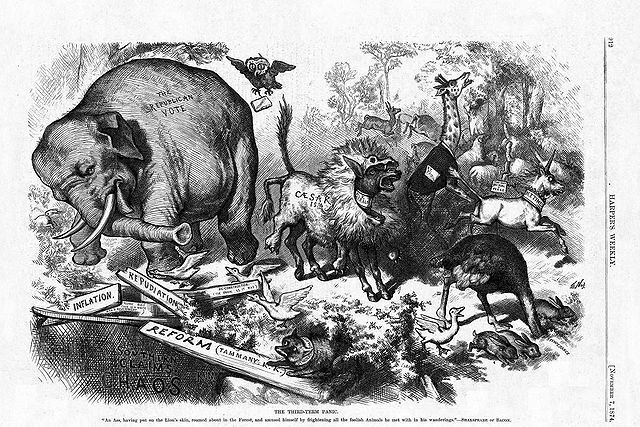 Thomas Nast continued to make use of the iconic elephant and donkey in his cartoons to represent his opposition to the political situation in America. In 1877, Nast depicted an injured elephant kneeling at a tombstone labeled the Democratic Party after Republican Rutherford B. Hayes won a controversial victory into office. In a cartoon within the Herald of 1879, Thomas Nast drew a politician grabbing onto a donkey labeled the Democratic Party by his tail to keep it from going face-first off a cliff into financial chaos. The Republican elephant in the background is portrayed as a sluggish animal lying on the road to block the way towards an election victory. By 1880, other American cartoonists caught onto the rising popularity of the symbols and spread them across the country in political cartoons. More than 100 years later, the emblems can be found in cartoons, literature, political propaganda, and even campaign buttons on each sides of the platform. While Nast chose both of the animals to represent the negative characteristics of stubbornness and destruction, the parties have spun the symbols to demonstrate their positive attributes in office. Despite the fact that politicians often change their stripes, the donkey and elephant remain the official mascots of the two largest American parties that still can never seem to get along with one another. What Happens to Delegates When a Candidate Drops Out? What Did Thomas Jefferson Do? What is Hillary Clinton Net Worth? What’s The Most Dangerous City In The World in 2014? What Happens to Delegates When a Candidate Drops Out? What is the Illuminati? Was Aunt Jemima a Real Person?